Here is the 2nd post for Halloween and boy does it scream Halloween and is Fang-tastic. 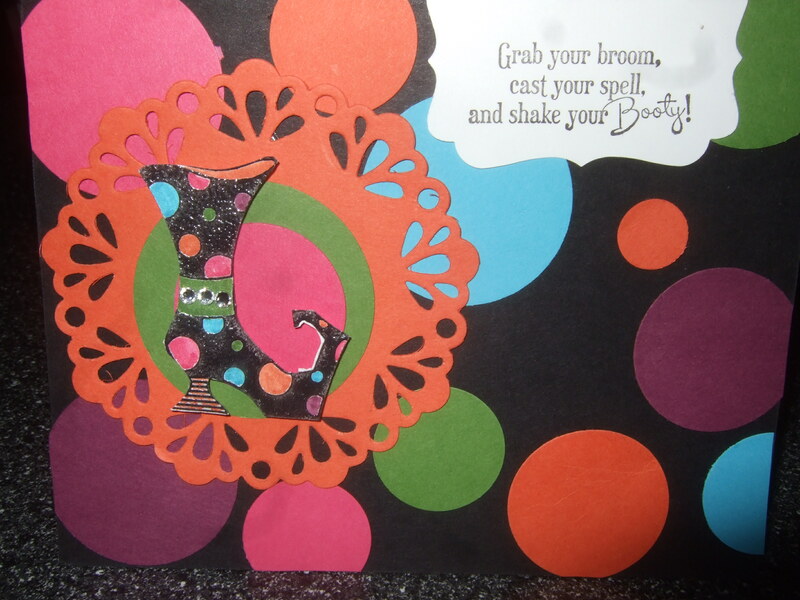 Cammie made this spooky card for her Halloween cards this year. She thought it was a simple concept until she had to punch, then shape and stain 12 teeth per card but oh is it worth the effort. The fangs were punched using the Blossom Builder #121808 and the Bird Builder #117191 punches from the Stampin Up Annual catalog. Each tooth was meticulously cut to form the tooth and then stained with cherry cobbler ink. The I Vant was done in MDS and the U was stamped using the Morning Post Alphabet stamp set #126592. So we vant you to have a happy Halloween! Happy Halloween! Today is my all time favorite Holiday and so I want to treat you all to 2 posts today. Yes 2 spectacular punch art cards- Mine and then later today Cammie’s devine Halloween card will be sure to delight you. But until then I would like to introduce you to Jack. I love how he turned out and continue to amaze myself with how a simple stamp- free card can have such an impact. When I created my Jack from punches I knew this would be my favorite of the bunch until I got Cammie’s Halloween card in the mail. Stay tuned later today for another post. I promise it is not a trick! Just to add more stress to my life, and 4 card designs were not enough I decided to create a new design just for Cammie. I was inspired by paint chips and made my own out of 3 shades of green to create this cute little monster complete with a rick rack mouth! 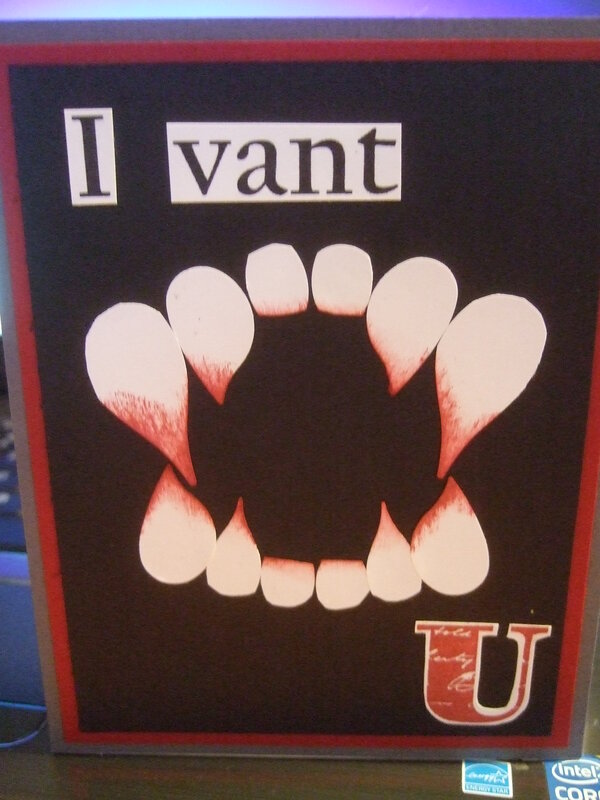 I think Cammie will like it since the card matches her Halloween Monster Munchie treats. By now my friends and family should be receiving their Halloween cards. I think I get worse every year and send out so many Halloween cards. This year I mailed 48 cards. Today’s card is one of my 4 major designs and it features the Bootiful Occasions stamp set #126597 from the Stampin Up Annual Catalog. When I first saw the Bootiful stampset I knew I had to order and knew I would be using it for Halloween. I layered the boot on the Delicate Doilies Sizzlet #126999 die. Background was created with various colors and sizes of circles to match the polka dots in the boot. For one day only, SU is offering 15 percent off almost every stamp they sell! The goal is to sell more stamps in a single day -Today, October 29 is the one-day Sell-A-Stamp Spooktacular! Make your list out now because the offer is for just 24 hours. Contact me with your stamp list at cathymorgan@wideopenwest.com Spread the word to all your friends and receive all the great hostess benefits. I saw this card on a blog and sketched it out and knew I wanted to recreate it for my dear friend Ken for his birthday. 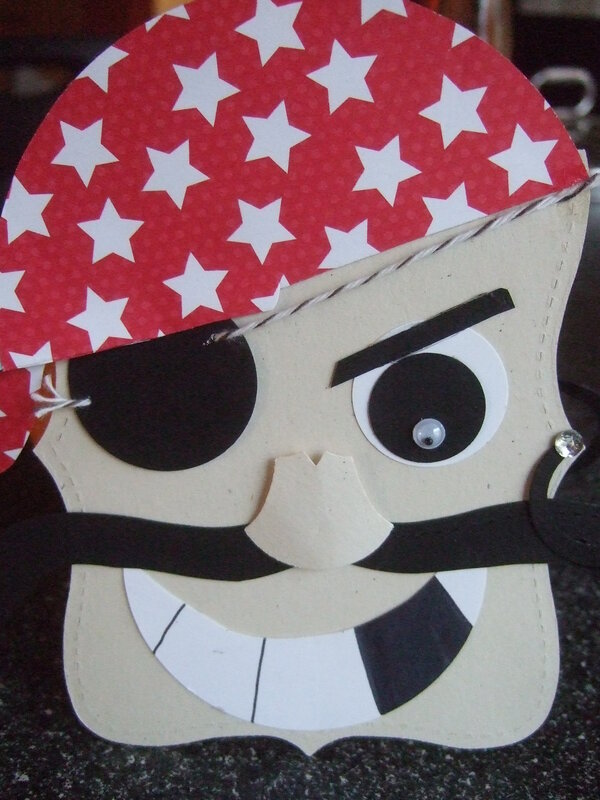 The sentiment inside (non- Stampin Up) says Ahoy Matey… Your ARRRH treasured. This expression truly fits the friendship that I have with Ken and his lovely wife Sue so I created this card just for him. The pirates head and mustache is cut from the top note die #113463. The eye patch, his eye and the earring are cut from various circle punches, the nose is from the Owl builder punch #118074. I used the 3 1/2 inch circle to get the general shape of the head scarf and then fussy cut it from a piece of scrap retired Under the Big Top DSP. I added a piece of bakers twine to attach the patch and finished it with a piece of bling for the earring. 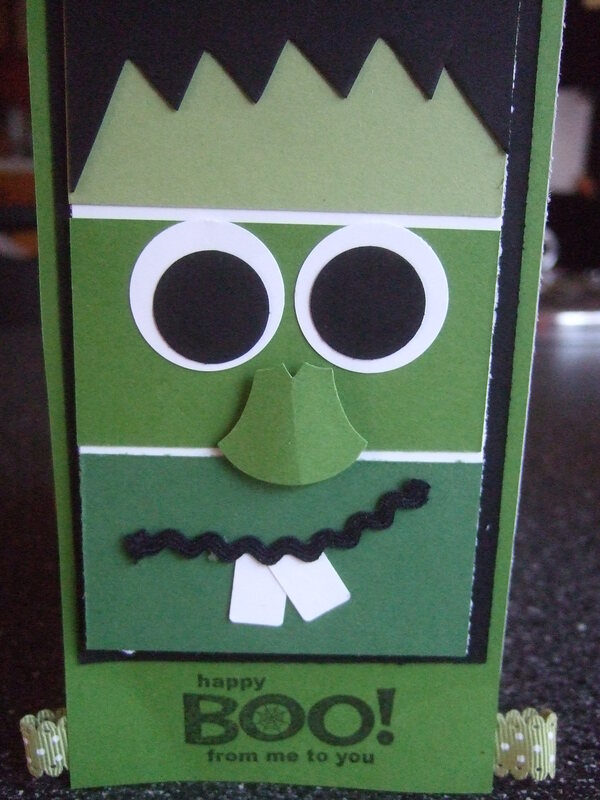 This card could also be used as a cute Halloween card or an invite to a come as you aren’t party! I hope Ken likes this card as much as I enjoyed making it. If he does not, he’ll just have to walk the plank! Today’s second post is one of my 4 designs of Halloween cards. 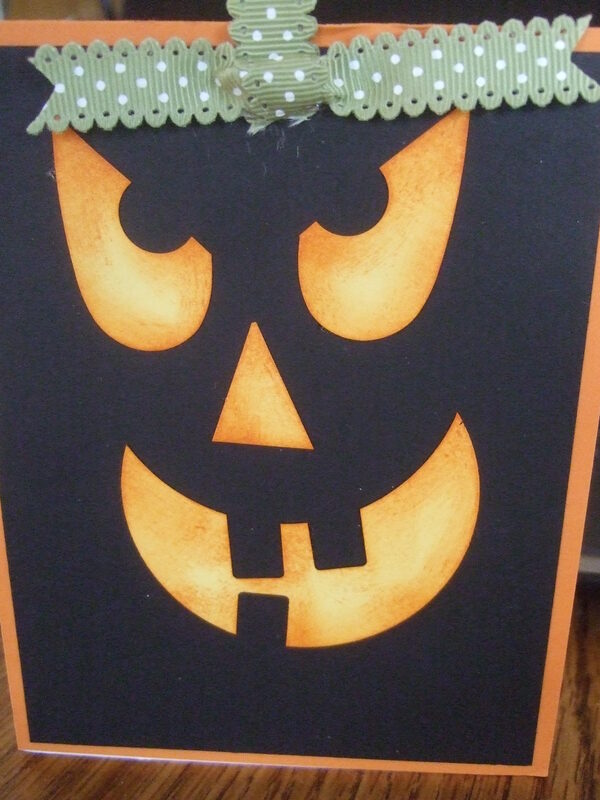 This card features all things Halloween from the Stampin Up Holiday catalog. The DSP is from the fabulous Howlstooth & Scaringbone Collection #126906. I am a sucker for Halloween DSP but seriously this year Stampin Up came up with a collection that rocks. Love the stripes, chevrons, plaids and polka dots in one collection. The stamped image is from the single stamp Frightening Feline #128105, the bow is from the 1/2 ” Striped Satin Ribbon #127837 and the eyes are rhinestones . The details on this card are what I think makes this card. 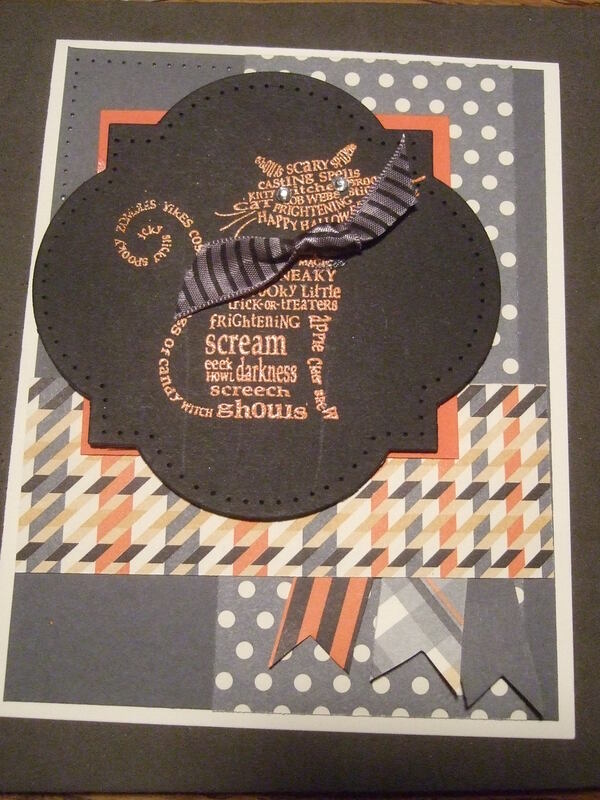 I embossed the Feline in Tangerine Tango embossing powder on black card stock that was cut out from the Window Frames Framelits #129021 and then finished it by using the coordinating piercing templates from the Festive Piercing Pack #127857. This card turned out so cute and I can contribute that to how all the Stampin Up products work together.